Sections refer to the units that your course home page is divided into. This page explains how the top section works, how to change the number of sections, how sections are edited, how sections are moved, and how sections are hidden. 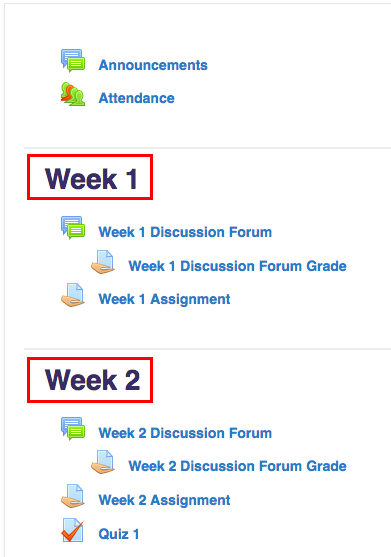 In the example below, sections have the customized names Week 1 and Week 2. Learn how to change the overall appearance of the sections by visiting our Changing your Course Format page. The top section will always stay at the top of the page and cannot be moved or hidden. 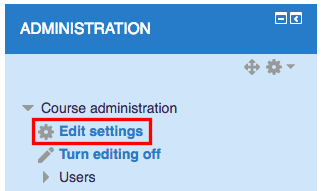 By default, it includes a link to the Announcements forum for your course. A "Q & A Forum", "Virtual Office" and the Attendance activity are also often included. Click Course format to expand and under "Number of sections", select the number of sections that you would like to have. In the upper right, click on the orange button Turn Editing On. 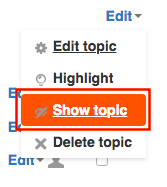 To the right of the section title you want to edit, click Edit and select Edit topic from the drop-down menu. Note: For the top section, there may be no title and you will need to select Edit section from the drop-down menu. Uncheck Custom and type a new name into the text box. Note: Alternatively, you may click the pencil icon to the right of the section title and press enter/return on your keyboard to save the new name. Click on the compass arrows icon to the left of the title of the section you want to move and hold down the mouse button. Drag the section up or down to move it to a new location. To the right of the section title of the section that you want to hide, click Edit and select Hide topic from the drop-down menu. Students will now see a message that the section is not available instead of the section content. Note: If you would like to automatically hide the section until a certain date, until an activity is completed, or only show it to certain groups, you can add an access restriction in the same area where you changed the name of the section under "Restrict Access". To make the section visible again, simply go to the same drop-down menu and select Show topic.